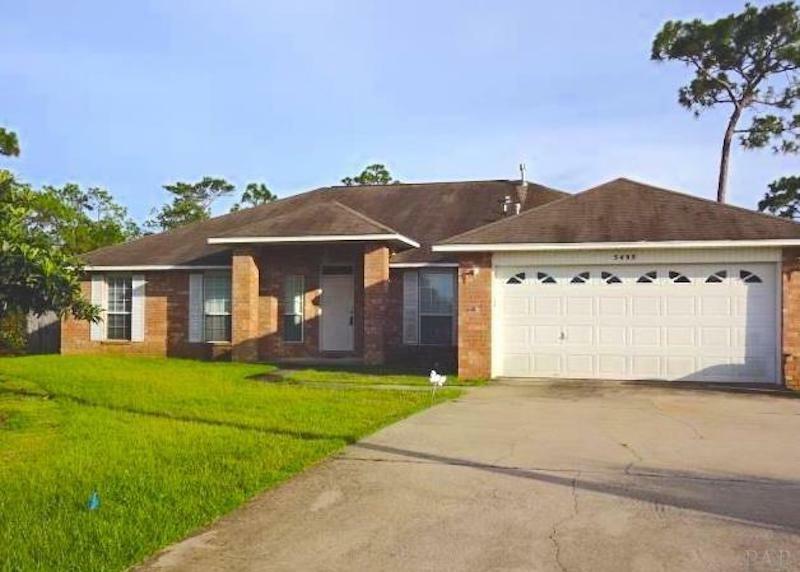 Beautiful Four Bedroom Three Bath brick home in the Estates at Emerald Shores located just minutes to the back gate of NAS Pensacola and a ten minute drive to the award winning white sand beaches of Perdido Key! This oversized cul-de-sac lot is one of the largest in subdivision with a massive fenced backyard, plenty of room for a pool, plus the owner is leaving you with a playground and trampoline! The covered front porch opens to a newly tiled entry and large family room with high ceilings, wood burning fireplace and brand new carpet. The eat-in kitchen with breakfast bar is completely remodeled and has brand new everything including cabinets, granite, and tile flooring. The master suite features a huge newly carpeted retreat and an amazing en-suite with a walk-in closet, soaker tub, separate walk-in shower, and double sink vanity. There are three additional great sized guest bedrooms also newly carpeted & two full guest baths! This home boosts a large two car garage & attic space for plenty of storage. Quiet low traffic in the back of cul-de-sac street with no rear neighbors. Priced to sell this home will not last on the market long...call today for a private showing!